Since it was Ramadan most of July and I got a lot of time stuck in a heavy traffic, I used that time to listen to an audiobook and catch up on my reading. 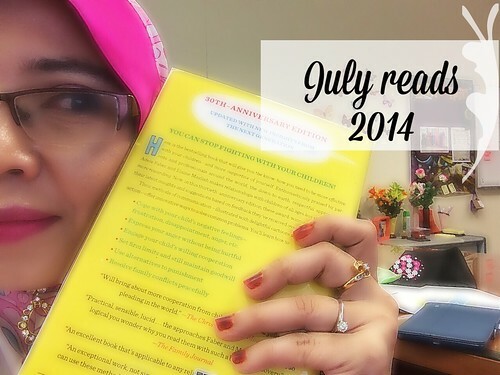 I can't believe that I've finished reading six books in July. This is some kind of a record for me. I am happy that I have finally enjoying literature and appreciate the world that these writers create. 3. Ignite Me by Tahereh Mafi - This is the second book I read by Tahereh Mafi. I like Ignite Me better than Shatter Me. This is when Juliette discover her true potential and she got to spend some alone time with Adam. It's kinda a war stories but with lots of cool super power being there. 4. Unravel Me (Shatter Me) by Tahereh Mafi - The third a last book of the series. By far this is the best book ever. I love reading about Juliette and Adam. It's the kind of story that give you hope and grew on you. 5. Unlucky 13 (Women's Murder Club) by James Patterson and Maxine Paetro - I just love this book. Even though I am a little bit late jumping into Women Murder Club series but I like the characters and the book so far. One thing I am not a fan of was there were too many stories in the book. I kinda wish Mr Patterson focus more on one or two story at a time. 1. The 6th Target (Women's Murder Club) by James Patterson and Maxine Paetro - the 6th series of Women's Murder Club series. The case is interesting and scary. It's always scary when it involves a missing child. 2. The 5th Wave by Rick Yancey - Ah.. the alien invasion kinda book. It's a little bit hard for me to get into. I only like Cassie point of view. It's a little bit hard for me to imagine this world. It would be nice to see it on film. Looking froward to the second book this september. 3.The Cuckoo's Calling (Cormoran Strike) by Robert Galbraith - Started to read this book today.